Map, Quarter Inch Map of Great Britain, 4th edn with National Grid, Quarter Inch series, scale 4 miles to 1 inch, published by the Ordnance Survey, Southampton, Hampshire 1946. 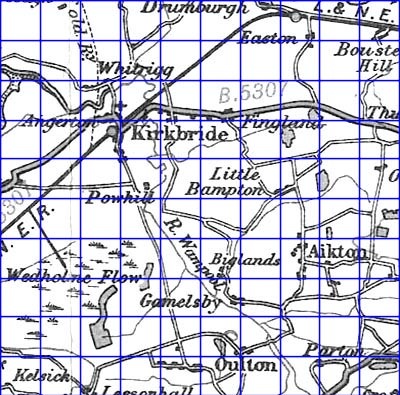 Map, The Diocese of Carlisle, Cumberland, Westmorland, and Lancashire North of the Sands, now Cumbria, scale about 4 miles to 1 inch, by Rev Euston J Nurse, published by Charles Thurnam and Sons, 11 English Street, Carlisle, Cumberland, 1918 and 2nd edn 1939. Approximate 10Km square, plus overlaps. Relief map, digital image, Cumbria Relief Map, data downloaded from NASA, processed by Jean M Norgate, Longsleddale, Cumbria, 2009.